The 2013 Nobel Prizes were recently awarded. The Nobel Prize is an international award that is given every year to individuals who have made a discovery that significantly impacts mankind. The awards are given in the fields of Physiology or Medicine, Chemistry, Physics, Economics, Literature, and Peace. It is the highest honor an individual can receive in each of these fields. 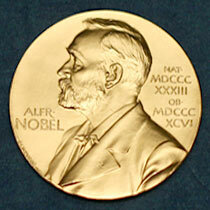 The Nobel Prize was started in 1901. The Nobel Prize in Physics went to François Englert (of Belgium) and Peter W. Higgs (of the United Kingdom) for predicting the existence of the Higgs particle. Scientists had long been baffled by how tiny particles (those smaller than atoms) got their mass. Mass is the amount of matter in an object. Englert and Higgs independently predicted, almost fifty years ago, that this mass was because of a particle that was yet to be discovered! Last year, through some experiments done at a European research institute called CERN, the particle was detected for the first time ever. Can you imagine predicting something and then having to wait for almost fifty years to find out that you were right?! The Nobel Prize in Physiology or Medicine went to James Rothman (of the USA), Randy Schekman (of the USA), and Thomas Südhof (of Germany and USA) for their work in understanding how various molecules are transported within the cell or outside the cell. Tiny bubbles called vesicles move these substances around the cell and also help push them outside when needed. The timing of the movement of these molecules is very important, and when the timing is off, it can be the cause of diseases such as diabetes, Alzheimer’s, and others. The Nobel Prize in Chemistry went to Martin Karplus (of Austria and USA), Michael Levitt (of Israel, UK, and USA), and Arieh Warshel (of Israel and USA). Their work has made it possible to use computers to discover new drugs for diseases. In the olden days, chemists had to actually mix all kinds of chemicals to understand how they reacted and how they might help in curing a disease. The chemicals and the experiments kept getting more complex. Thanks to the work of this year’s winners, scientists can now do a lot of their experiments using computers. Alice Munro (of Canada) won the Nobel Prize in Literature. She has written many short story collections in English. Some of her collections are “The View from Castle Rock”, “Who Do You Think You Are?”, and “Dance of The Happy Shades”. Her stories are based on current times and many are set in small towns in Canada. Her main characters are often women or girls. The Organization for the Prohibition of Chemical Weapons (OPCW) won the Nobel Peace Prize for its efforts to rid the world of chemical weapons. Chemical weapons were used in both World War I and World War II. They have been used at other times as well, most recently in August in Syria. Chemical weapons are chemical substances that are produced to kill or hurt people, and are often delivered through devices such as bombs. The OPCW’s goal is to have a world free of chemical weapons. It works with various countries and organizations to safely get rid of them. The OPCW was established in 1997 and has its headquarters in The Hague, Netherlands. Three Americans, Eugene Fama, Lars Hansen and Robert Shiller, won the Nobel Prize for Economics. Their work helps us understand how investments such as stocks and bonds behave over time. It is usually hard to predict whether their prices would go up or down over a few days. However, the trends are more predictable when one looks at the price over a few years. You can find some Nobel Prize facts here. In 1989, the Nobel Prize Committee contacted the wrong “Norman Ramsey” for the Nobel Prize in Physics award. Here is a short clip with the correct Norman Ramsey talking about it.